1. Make sure the surface smooth,clean and dry before applicating the led strip. 2. Please note this is a standard kit for 16.4ft,it cannot connect more than 16.4ft or it will damage the power supply and strip lights. 3. When installing just line up the marked arrows. 【RGB LED Strip Lights】Color-changing RGB LED tape light are perfect for adding a little brightness to your decorating scheme. It is perfect for placing under cabinets, desks, and shelving units to provide attractive lighting options. You've found the place for all your LED lighting needs. 【12-Volt Energy Saving Light Strip】Supplied with 12V 5A power supply, our LED strip lights consumes fewer than most of other lights. And it is safe to use in indoor task lighting. 【IP65 Waterproof】Our lights have a waterproof option that is IP65 rated. It is safe to use outdoor, such as garden, patio, balcony, party, wedding decoration. 【Easy Installation & Cuttable】 Plug and play without wiring. Self-adhesive back tape can be fit on any clean, dry and flat surface. No damaging to your wall or desk. It can be cut every 3 LEDs along the cutting marks, without damaging the rest strips. 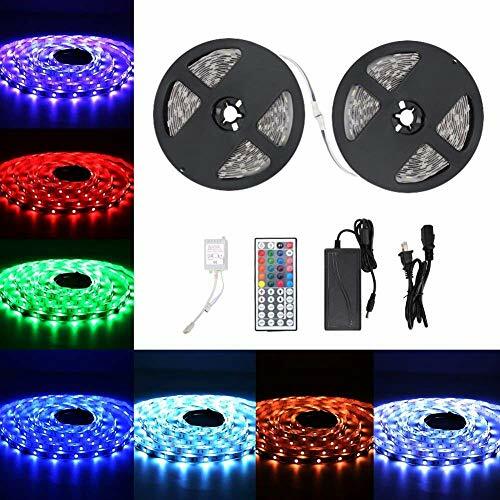 【What You Will Get】1x16.4ft/5m 150LEDs SMD 5050 RGB Strip Lights(IP65 waterproof), 1x 44 key IR Remote ,1x Controller Box, 1x 5A 12V Power Supply (US Plug). 12 month warranty and 24h/7days friendly customer service. If you have any questions about this product by Urlitoy, contact us by completing and submitting the form below. If you are looking for a specif part number, please include it with your message.